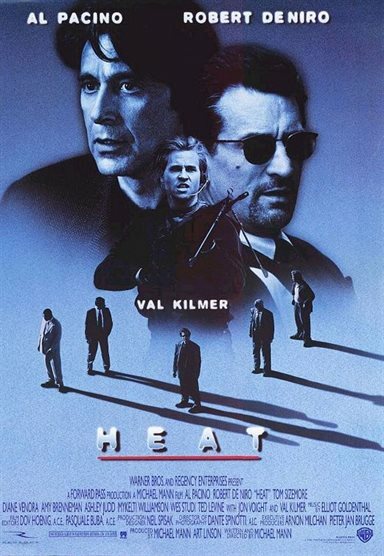 Download Heat in Digital HD from the iTunes store. 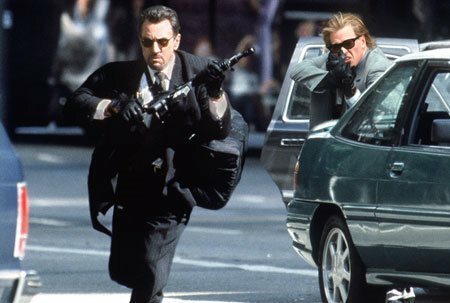 Heat images are © Warner Bros.. All Rights Reserved. Don't let yourself get attached to anything you are not willing to walk out on in 30 seconds flat if you feel the heat around the corner… It was with these words the world was introduced to the trailer for the Michael Mann (Public Enemies) film that would become a classic. Bringing together two powerhouse actors face to face for the first time in the same film gave the movie credibility even before one frame had been shot. A film that would become this director's biggest picture and be the ultimate crime heist story sent in modern day. That movie is Heat. Mann had previously had some success in the past, including creating the hit television series Miami Vice, directing Manhunter, and the Daniel Day-Lewis driven The Last of the Mohicans, but Heat brought him even more credibility in a tough industry. His ability to capture the perfect shot and use the "real world" as his canvas has become kind of a signature of his. Once again, it is in in full view in Heat, as he shot the film in over 95 different locations around Los Angeles without using a single soundstage resulting in some magnificent views that envelopes the audience. Not only are the actors the centerpiece of Mann's film, but the city, as well, is an unseen pretense that gets as much attention and love as the cast. Robert DeNiro (Raging Bull) and Al Pacino (The Godfather) head up this all-star cast (and the first time they share dialog together on screen which was something people had been clamoring for since Godfather II) that also includes Val Kilmer (The Doors), Jon Voight (Transformers), Tom Sizemore (Natural Born Killers) , Ashley Judd (Double Jeopardy), and a young Natalie Portman (Black Swan). While DeNiro's performance is more nuanced, Pacino tends to be "in your face" and rough. For me, DeNiro's silent observer says more than the dialogue at times and just seeing both veteran actors on the screen is a study in contrasts. but the undeniable draw of the star power in this movie speaks volumes of what is possible in the film medium when you put the best of the best together to make a movie. Heat, set in Los Angeles, is the story of two of its citizens and the respective people in their lives. One, Neil McCauley (DeNiro) a career criminal by trade, a great thinker, and a very standup guy (as long as you don't get on his bad side), the other, Lt. Vincent Hanna (Pacino), is a driven cop who will let nothing stand in his way to catch his man. Mann dives into each of the men's lives displaying the idea that life is not just black and white, and how each person is just a shade of gray with a core set of principles to get them through the hard spots in the world. The film, itself, has never looked better. Boasting a new 1080p transfer from a brand new 4k negative makes the landscapes and action of Heat envelope your living room. The only thing better would have been the release of a 4K UHD edition of the film, which I am sure is on the horizon. The audio has also been remastered in English 5.1 DTS-HDMA which truly packs a great punch. The dialog is crisp and clear and the climatic shootout that has even been used in Marine training videos will make you feel like you are in the middle of a firefight. The only possible issue with this new set is the Blu-ray extras. Aside from the two new festival talks with some of the cast and Michael Mann, the rest are presented in non-anaphoric 480p definition and are recycled from other releases in the past. 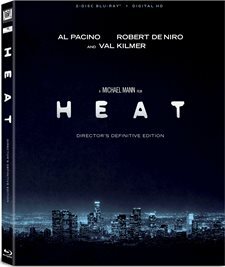 This was a huge disappointment, as these features, including a one-hour documentary, The Making of Heat, would have been great to see upgraded to at least fill the entire television screen. 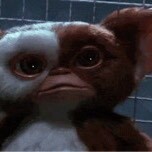 There is a reason this film as been named one of the top 100 movies of all time. The cast is simply amazing, the story is one of the best crime dramas ever put on film, the dialog is sharp and smart, and the end result is an epic film that will be studied by film lovers and critics for decades to come. 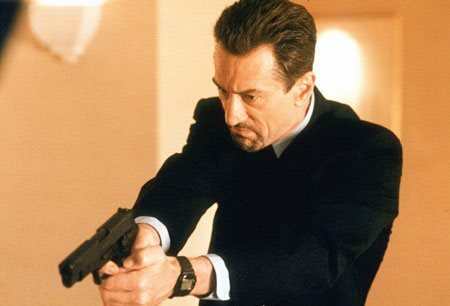 Heat images © Warner Bros.. All Rights Reserved. Neil McCauley: A guy told me one time, "Don't let yourself get attached to anything you are not willing to walk out on in 30 seconds flat if you feel the heat around the corner." Now, if you're on me and you gotta move when I move, how do you expect to keep a... a marriage? Need something to get the taste of #mockingjay out of me.